Retro low pass, band pass and high pass filters which add that special mojo to a track. 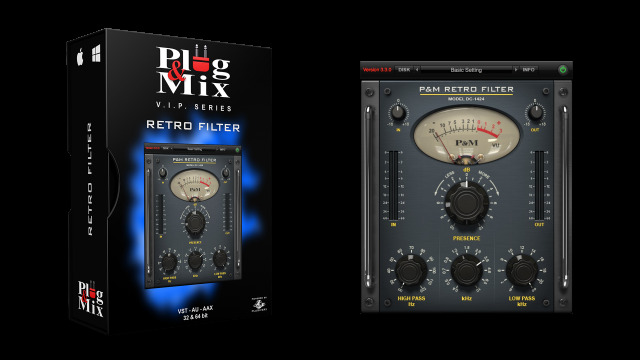 This plug-in sounds great on guitars, bass or vocals - anywhere there is a need for creative tonal sculpting. Dial in the overall effect strength with the big Presence knob while using the kHz knob to determine frequency you are accentuating or deemphasizing. The High pass and Low Pass knobs help to shave off unwanted frequencies on the Low and High ends. - Presence : Increase or decrease the sound of the filters on your track. - High Pass : This knob filters out frequencies below the specified point. - kHz : Determines the width of the band pass filter. - Low Pass : This knob filters out frequencies above the specified point. - Selector buttons : Choose between Low Shelf/Band Pass, Band Pass/Notch/ and High Shelf/Band Pass.